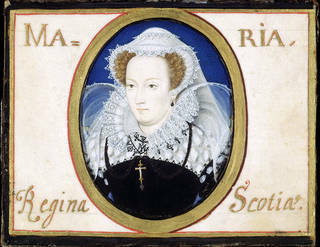 The V&A holds a number of the needlework panels produced by the household of Mary, Queen of Scots, during her long imprisonment by her cousin, Elizabeth I, including pieces attributed to Mary herself. 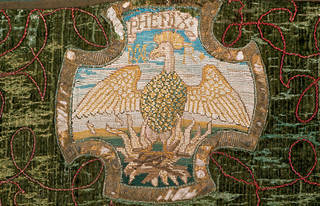 They are extremely rare surviving examples of embroideries known to have been worked by royalty, offering a unique human insight into one of the most notorious episodes in English history. I asked her Grace, since the weather did cut off all exercises abroad, how she passed the time within. 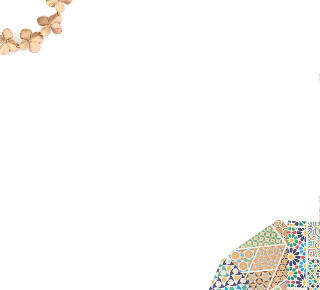 She said that all the day she wrought with her needle, and that the diversity of the colours made the work seem less tedious, and continued so long at it till very pain did make her to give over. In 1568, ten years after Elizabeth I ascended the English throne, her cousin Mary, Scotland's deposed Catholic queen, was forced to flee across the border into England, expelled by the forces of a powerful Protestant coalition. Mary was confident that Queen Elizabeth would offer her help and protection, but as a high-profile Catholic, she was an extremely unwelcome guest in her cousin's newly Protestant nation. Mary also had a long-held claim to the English throne (via an uncontroversial blood link to Henry VIII's sister), and so represented a serious political threat to the childless Elizabeth, who many Catholics believed to be illegitimate. To neuter her cousin's power, Elizabeth issued an order for her to be held in detention – and Mary was to remain in custody for the remaining eighteen-and-a-half years of her life. After Mary's death in 1587 the embroidered panels now in the V&A's collection were given to Ann Dacre, Countess of Arundel. They are known as the 'Oxburgh Hangings' because they arrived at Oxburgh Hall in 1761, most likely via the marriage settlement of a descendant of the Arundel family, Mary Browne, to the 4th Baronet of Oxburgh. The panels were mounted on green velvet, most likely in the 17th century, and some were later reconfigured. 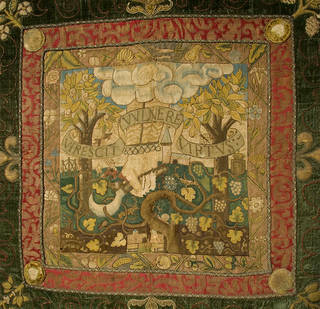 In their current form they comprise of three hangings, 'The Marian Hanging', 'The Shrewsbury Hanging' and 'The Cavendish Hanging' and a fourth piece know as 'The Oxburgh Valance', all of which are on loan to Oxburgh Hall. 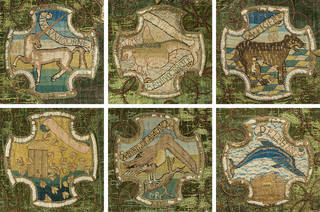 A further hanging was broken up back into individual panels, many of which are in the V&A's collection (some are on display in the British Galleries) and three are now part of the Royal Collection. Now well over 400 years old, the intricate panels produced by Mary during this period demonstrate, via a series of veiled symbols, the resistant pride of a woman with few other ways to assert control over her existence. The embroideries in our collection were produced between 1569 and about 1585, the years in which Mary lived in the custody of George Talbot, Sixth Earl of Shrewsbury (a wealthy Protestant). Mary was moved around Talbot's various country properties and although she wasn't kept in a cell – she had a large domestic staff, well-furnished chambers and a personal chef – she wasn't allowed outdoors unsupervised. This severely restricted life was no doubt made more bearable by extended visits from Talbot's second wife, Elizabeth – better known as Bess of Hardwick – who was both a formidable character and an accomplished embroiderer. 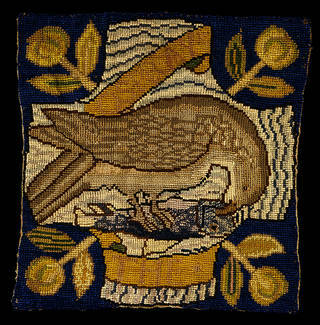 Domestic needlework was a popular past-time for women in England in the 16th century. It became customary for wealthy women to work together, embroidering individual panels which could be sewn together to form a larger work. These larger lengths of fabric could then be made in to curtains or covers for a bed, or hung on the wall in the same way as a tapestry. 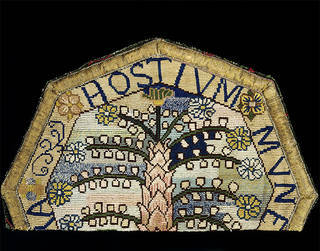 Bess, Mary and female members of Mary's household embroidered over 100 panels. Although we don't know how they were originally displayed, their survival is a testament to the high quality of the embroidery work and significance of their royal maker. Each of the surviving hangings comprises a central rectangular 'picture' panel surrounded by smaller octagonal panels decorated with letters or symbols, and cruciform (cross-shaped) panels that depict birds, animals and fish. Together the embroidered panels comprise a colourful introduction to the kind of visual references Mary had access to as a Tudor aristocrat. Their subjects range from the everyday creatures of the British domestic and wild landscape (honey bees, a falcon, a mole, a dog gnawing a bone), through to the exotic (an elephant, a tiger, an 'Ape of Turky', a dolphin) and the fantastical (a dragon, 'A Rhinocerote of the Sea', a unicorn); they also feature a number of plants, ranging from a dandelion to a palm tree. Most of the embroidered motifs were copied from the woodcut illustrations of 'emblem books' (volumes containing allegorical illustrations with explanatory texts) and botanical and natural history books, by well-known authors including Claude Paradin, Conrad Gesner and Pierre Belon. 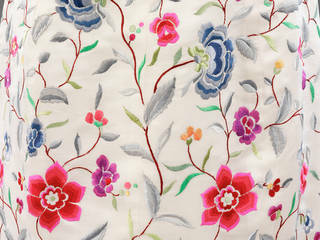 They were made using counted-thread embroidery (a technique in which a set number of stitches are decided on before the embroider begins work), with stitches worked over the threads of a coarsely woven linen canvas, using coloured silks and gold, silver and silver-gilt thread. Mary, Bess and members of the household (including the professional embroiderers recorded in Mary's household accounts) used only two, relatively humble stitch styles: cross stitch and (diagonal) tent stitch, creating practical pieces that wore well. During Mary's lifetime the panels may have first served as cushion covers or been used to make smaller hangings for Bess's various houses. Mary also frequently sent embroideries as gifts to friends and supporters, as well as to Queen Elizabeth, with whom she wanted to try and maintain a relationship. Many of the panels feature Mary and Bess's monograms – Mary's was the letters MA superimposed on the Greek letter Φ, and Bess's the initials ES. The majority of Mary's 'signed' pieces were later sewn onto what is known as 'The Marian Hanging'. 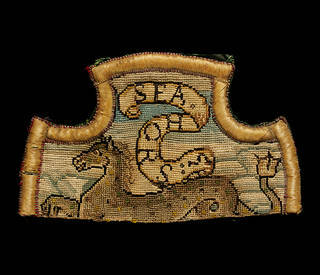 The embroideries attributed to Mary suggest that needlework was a powerful means of resistance during a period when both her letters and actions were under constant surveillance. To the knowing eye, a series of covert and very personal symbols disrupt embroidery's accepted iconography. For example, one slip features a phoenix – as a mythological creature capable of regeneration, this is a powerful symbol of immortality. In another, a crowned ginger cat toys with a grey mouse: a veiled representation of the unequal and uneasy relationship between herself and (red-haired) Elizabeth. In the panels on the Marian Hanging, a marigold (a name derived from 'Mary's gold') turning towards the sun indicates courage in adversity, and a yellow rose attacked by 'THE CANKER' (a group of caterpillars) suggests the devouring feeling of despair. The central panel is a complex piece depicting a grapevine and a hand holding a pruning knife. It references Mary's claim to the throne, suggesting the need to cut away the fruitless branch of the Tudor tree represented by the childless and 'illegitimate' Elizabeth. The point is driven home by the Latin motto 'Virescit Vulnere Virtus' (virtue flourishes by wounding). In 1586, after years of driving ambitions to see a Catholic monarch back on the throne, Mary was tried for being part of an assassination plot against Elizabeth. She was found guilty and beheaded at Fotheringhay Castle the following year.